RAPAPORT... A storied diamond connected to the Oppenheimer family will be among the top lots at next month’s Geneva auction at Christie’s, with a presale estimate of $2.5 million to $3.5 million. The rectangular-cut, 25.27-carat, D-color Jonker V ring will go under the hammer at the Magnificent Jewels sale on May 15, the auction house said last week. The stone was cut from a 726-carat rough South African farmer Johannes Jacobus Jonker discovered in 1934. At the time, the Jonker was the fourth-largest gem-quality diamond ever unearthed. A subsidiary belonging to Sir Ernest Oppenheimer, the founder of Anglo American and a former De Beers chairman, bought the polished stone. 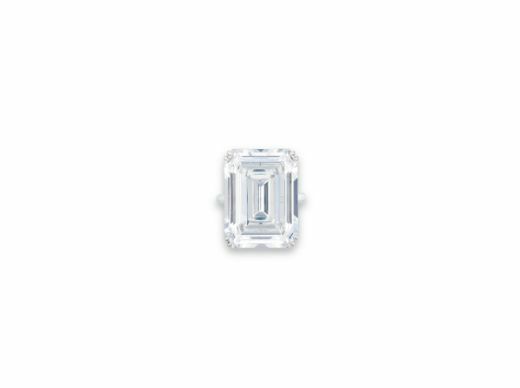 In 1935, Harry Winston purchased the diamond and set it in a ring. Later that year, it was displayed during the Silver Jubilee celebrations for King George V and Queen Mary. Christie’s will also offer a heart-shaped, fancy-deep-blue diamond ring, featuring two stones weighing 2.22 carats and 2 carats, valued at $3.5 million to $4.5 million. Separately, an old cushion-cut, 118.05-carat, fancy-yellow diamond carries an estimate of $2.5 million to $3.5 million. Other notable lots are a necklace comprising 110 natural pearls with a presale estimate of $2.5 million to $3.5 million, and a pear-shaped, 75.61-carat emerald pendant necklace expected to fetch $2 million to $3 million. In addition, the Geneva sale will feature an early-19th-century emerald and diamond fringe necklace Henri d’Orléans, duke of Aumale, gave to his goddaughter, Princess Hélène of France, for her 1895 wedding to Prince Emanuele Filiberto of Italy. The auction will also include jewels from Cartier, Bulgari, Van Cleef & Arpels and Harry Winston. Christie’s will preview the jewels in London from April 9 to 11, and in Geneva from May 10 to 15.